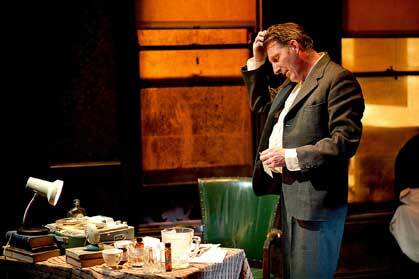 Adrian Dunbar stars as the doomed Irish playwright Brendan Behan in Brendan at the Chelsea. Irish playwright Brendan Behan lived his life like it was a form of protest, because it often actually was. Born to a working class family in Dublin, his life could very easily have been as difficult and circumscribed as the one his father had led save for one saving factor that changed everything -- his genius. Because he came from far outside the leafy south Dublin suburbs, where becoming a writer was a much less revolutionary act, Behan was initially overlooked. He made good use of his own obscurity, turning it into a permission slip to flout every social code in the theocratic rulebook of the joyless Catholic gulag that Ireland was when he reached maturity. In Brendan at the Chelsea, the new play from Belfast’s Lyric Theatre about his life in New York now playing at the Acorn Theatre in Manhattan, Behan’s playwright niece Janet has teamed up with the formidable Irish actor Adrian Dunbar to present a play filled with glimpses of the frenetic energy and anarchism of Behan in his prime. He was a bit of a walking hurricane, Brendan. Things were never more dangerous than when the brief periods of calm descended. Brendan at the Chelsea wisely focuses on the qualities that made him a star, including his keen awareness of how much of an affront he offered to the Irish establishment and a sense of sheer mischievous play that hadn’t been seen on the Irish stage in generations. But it also focuses on the qualities that would undo him, which were often linked as it turned out. As Behan, Dunbar is a little too physically imposing to convey the mercurial, puckish Irish writer entirely convincingly. Behan was a trickster and a charmer, capable of great kindness and equally capable of devilment calculated to wound. But Dunbar makes for a much more somber stage presence, bringing out Behan’s struggles but undercutting his roguish qualities. Throughout Brendan at the Chelsea unfolds like a memory play, with diverting detours into farce and heightened naturalism along the way. That means that tonally it makes unexpected and lively twists, such as echoing the riotous comedy of Behan’s play The Hostage when it brings two unabashedly queeny gay men onstage to dance the Madison, and for Behan to pursue, for example. But when moments like this happen they throw up interesting questions. Acknowledging Behan’s bisexuality (or homosexuality) isn't quite the same thing as addressing it. What did it mean to his work? How did it change how he thought of himself? What did his long-suffering wife Beatrice think about it? The answer is that we don’t really know because the play leaves all of that rich material offstage. Insofar as it’s addressed at all it’s usually for comedy, or to confirm that it was an issue for the playwright. The biographical details are presented, but the analysis less so. This is tantalizing stuff, though. To be gay or bisexual in the fifties in Ireland offered a completely destabilizing challenge to the dominant culture that was much bigger than the issue of gayness itself. Issues of class, class discrimination, militant republicanism, Behan’s bone deep anti-clericalism -- where was all that? There’s no question that Behan possessed enough demons to keep an exorcist in business for decades, but the play skims the surface of what the people closest to him actually mean to him. Only his wife Beatrice, played by Pauline Hutton, really gets close. But she’s left to recite a laundry list of domestic slights without ever really scratching the surface of whatever it was that brought them together in the first place. Maybe that’s the truth of what happened between them, but it would have served the play to crack that nut and see what it contained. Brendan at the Chelsea has a lot to say about the cruelty of addiction and the self-defeating way in which Behan rationalized it. One scene with his friend George, played by the excellent Richard Orr, provides the most accomplished and telling scene in the play. George informs Brendan that a new school of thought suggests alcoholism is actually a disease, and not only an affliction, and that perhaps he could benefit by tackling it head on. Behan dismisses his theory almost as soon as it’s offered of course. That’s because the people that stand to benefit most from therapy are usually the first to deny its effectiveness. Brendan at the Chelsea puts Behan on the couch, sometimes quite literally, but it gets sidetracked by his charm, the way that people once did, and it allows his witty quips to protect him from urgent challenges he faced. At the end of the play the audience is left wishing they could have known him better, a fate that the whole of Ireland once shared. Brendan at the Chelsea is playing at the Acorn Theatre on Theatre Row, 410 West 42nd Street. For tickets call 212-239-6200.